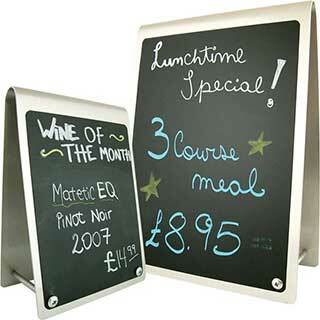 Our wide range of tabletop signs and tabletop blackboards helps you display your daily specials. 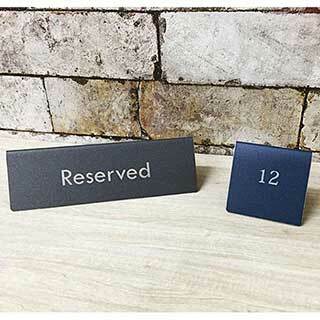 Our table numbers are supplied in metal, acrylic or wood to match the decor of your restaurant or dining room. 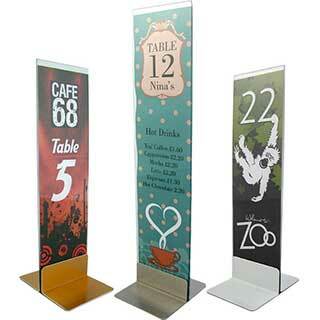 We supply table signs in various sizes and styles to meet the needs of all catering establishments. Our stylish tabletop blackboards can be used to show your menu and drink specials either on the bar or in the dining areas. We also supply a wide range of table linen, menu and wine lists, table top menus, table lighting and condiment caddies and racks. A contemporary metal reserved sign & table numbers available in three colours with your choice of text in black included in the base price. 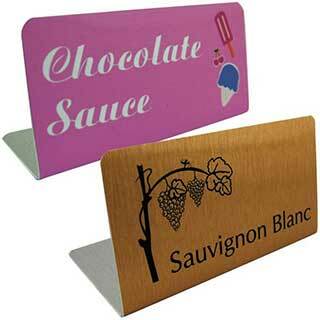 Table signs printed in full colour with your own design, logos and text at an additional cost. Your choice of text in black in one of three styles is free. Full colour personalisation available - One off set up cost £20. Unique card holders to hold a printed card menu, prie list or business card. Available in three metal colours with options for personalisation in full colour for an additional cost (Not available for Bowl Slip). These table signs are available in three styles, the bottom clip style is an L shape stand while the standing style is available in medium and large with a clip at the top. The unique bowl clip easily holds onto most bowl shapes and is ideal for restaurants, eateries & cafes. Three styles available - Bowl slip w65mm x h45mm x d42mm. Bottom Strip w80mm x h50mm x d50mm. Medium w50mm x h153mm x d69mm. Large w50mm x h253mm x d69mm. Can be printed in full colour with your own design - One off set up cost £20. Per item charge £0.65. These wooden number holders provide a convenient and stylish alternative to standard table numbers. 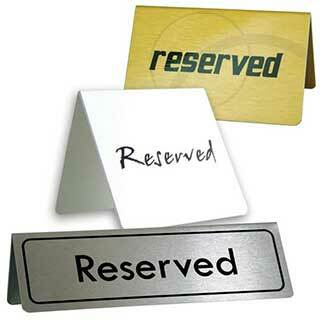 They are designed to be given to a customer to designate their table numbers. Table numbers are available in 2 sizes Small w50mm x h180mm and Large w50mm x h280mm. 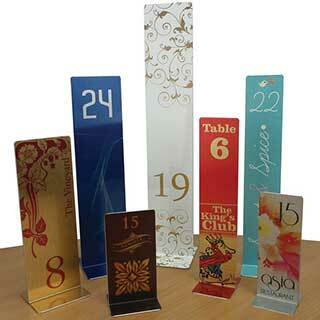 A selection of contemporary table number stands. Printed double sided. Three colours available - Gold, Silver or White. The basic price includes printing of numbers and text in black. Full colour personalisation is available. Full Colour Personalisation - One off setup cost of £25.00. A traditional way to identify your tables using metal table discs and number plaques with black numbers on gold, silver or white background. Sold in packs of 10 numbered 1-10, 11-20 and so on. Printed one side only. 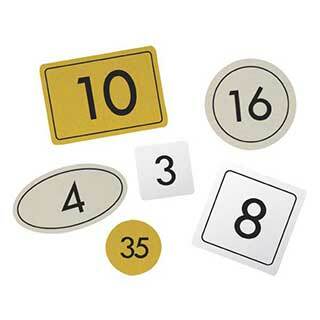 Each table number comes with self adhesive backing and there is a choice of several sizes. Various shapes. Printed black text on one side only. Complete with cleaning wipe to ensure good adhesion. Sizes available - Rectangle 65x45mm, Square 50mm, Round 30mm, Round 50mm, Oval 65x35mm (Polished Gold/Silver aluminium only). A contemporary metal and acrylic number stand available in two sizes and a choice of three colours. A great table number display which combines an incredibly easy to change display with a stylish & economical finish. 3 metal colours available for base - Gold, Silver and White. Printed double sided. Strong but flexible acrylic. Easy change printed inserts. Two sizes available - Small Overall size 60 x 217mm - Paper size: 60 x 210mm. Large Overall size 70 x 305mm - Paper size: 60 x 297mm. Full Colour Personalisation One off setup cost - £20. Sold individually. Table numbers and signs also available in metal, wood, abs plastic, acrylic and pvc. Please request the price for quantity orders. A contemporary, metal menu clip available in two sizes, three colours and designed to show table numbers and to hold printed menus or other information. Each menu clip can be supplied printed in your own design or logo for an extra cost. 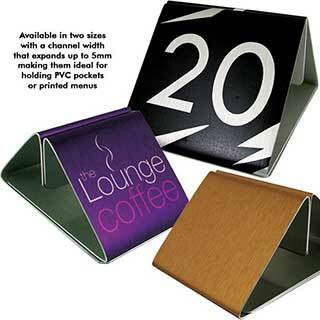 Can hold printed menus or can be used as a leaflet holder. Can be used in conjunction with Metal Stand. Menu clip available in 3 metal colours Gold, Silver or White. Two sizes available - Small w40mm x h28mm x d60mm or Large w70mm x h50mm x d90mm. Can be personalised for extra charge. A contemporary printed metal reserved tent sign or table numbers available in three colours with your choice of text in black included in the base price. Can also be printed in full colour with your own design, logos and text £25.00 one-off set-up charge. Choice of three colours - Gold, Silver or White. Printed double sided. Black text as standard in choice of styles. 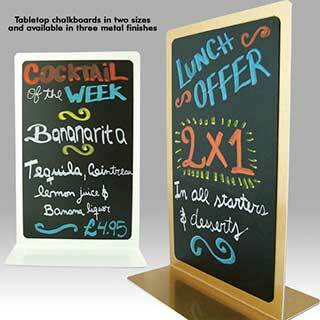 The free standing double-sided chalk blackboards are made from top quality wood, for easy write on wipe off use. There are four sizes of blackboard and two colours of base to choose from. Each one stands neatly on counter or table. 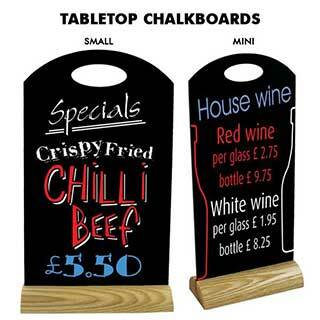 Each table blackboard is perfect for use as an offer menu or restaurant chalk board with a smooth rounded base. Available with light ash or dark oak wooden bases. Chalk pens can be used to personalise in full colour. Table blackboard in four sizes - Mini 100mm x 215mm. Small 150mm x 250mm. Medium 210mm x 350mm. Large 210mm x 470mm. Stylish metal chalkboard signs that feature a easy wipe clean blackboard on both sides. Each chalkboard can be supplied in gold, silver or white metal and are available in two sizes - Medium w147mm x h232mm x d100mm. Large w210mm x h340mm x d105mm. Easy wipe clean surface. For use with liquid chalk pens. Matching Menu Covers, Key Tags, Bill Presenters, Tariff Boards, etc. available. Stylish metal blackboard signs that feature a easy wipe clean blackboard on both sides. Each blackboard can be supplied in gold, silver or white metal. Two sizes are available - Medium w150mm x h211mm x d86mm. Large w211mm x h296mm x d110mm. These classy, contemporary engraved metal tent signs are ideal for use as reserved signs or table numbers. Scratch resistant engraved metal tent signs are available in various sizes - Small 60 x 60 x 60mm. Medium 95 x 55 x 55mm. Large 160 x 43 x 50mm. Single or double sided. Single line text/number as standard. Available in 7 scratch reistant colours - Black, Blue, Brown, Burgundy, Graphite, Green, Silver and White. Engrave your logo or design for a one off fee either single or double sided. Your design is engraved to reveal the silver metal underneath (except blue). One off set up cost £20.